Father Christmas will be visiting Devon very soon! 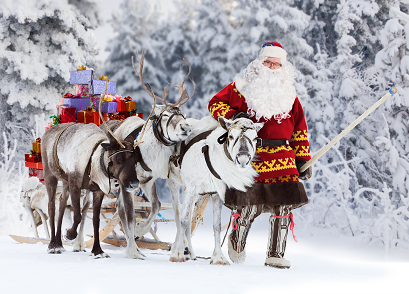 You can see Santa in cosy cabins, in sparkly grottos, on festive trains and on horse-drawn sleighs in town centres, shopping centres, garden centres and family attractions. Santa's Grotto is returning for Christmas 2018! Grotto entry costs just £6.99 per child and includes a free balloon, badge and gift from Santa. Plus, there will be quizzes with prizes for adults and children. To make a booking call 01626 835285. Join in with the festive fun when Santa goes to visit IKEA! Whilst there, mums and dads can buy a real Christmas tree too. Watch a magical Nativity performance featuring real animals before visiting Father Christmas in his festive grotto. Plus, options to have breakfast and cream teas with Father Christmas on set dates. Booking essential. For more details 01364 642023. Santa and his reindeer (who look like donkeys) will pay a special visit to the sanctuary and take residence in his Grotto. Tickets will be available to purchase each day on a first come, first serve basis. Call 01395 573156. Along with storytelling, singing and dancing with the elves, passengers will meet a very special guest when the train stops at Christmas Town. Santa Claus will climb on board to meet each child and give them a special gift. Booking highly recommended. Call 08000 232383. Journey to the North Pole on The Polar Express by tram. Sing along to the songs, drink hot chocolate and meet Santa and his happy bunch of elves. Each child will receive a special gift from Santa. Pre-booking is essential - dates are already selling out. For more details call 01297 20375. With 9 new Christmas attractions featuring the South West’s first ever Christmas Ice Show, Mary Christmas’ Bakery, reindeer food making station, Santa’s post office, the singing snowmen, Christmas craft and entry into Santa’s Magical Toy Shop featuring over 30,000 gifts! Booking essential. Tucked away within the stables find Father Christmas waiting in his magical grotto. Enter the festive grotto to meet him dressed in his traditional Victorian green suit. A gift will be given to every child. Booking is essential. Call 0344 249 1895. Refreshments will be served by Santa’s helpers onboard Santa's special grotto train. 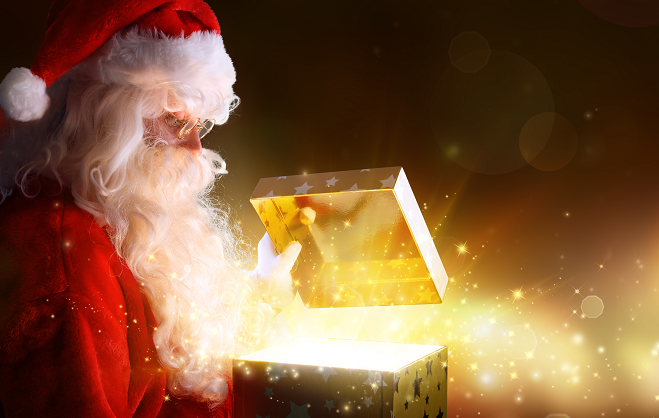 Each child will meet Father Christmas in his wonderful magical grotto and receive a Christmas present. All the trains start and finish at Buckfastleigh. Advanced booking is essential. Ring 01364 644370. A visit to see Santa includes a mesmerising walk through Santa’s Workshop before meeting Santa and receiving a very special gift. Includes free reindeer food, a free sweet treat and free photo opportunities. Children will have a truly magical Christmas experience at The Big Sheep and can meet Santa in his wonderland at weekends and during the school holiday. Meet Santa in his Grotto, see Santa’s Magical Light Show and play in the Ewetopia Indoor Playground. The friendly team at Lady’s Mile are fanatical about the festive season, so are inviting local families to visit its Christmas Grotto Weekends! Santa will be with at Lady’s Mile in his magical winter wonderland, so be sure to take a trip to Dawlish to meet him. Join Father Christmas in the stables as he shares magical stories and some festive songs. Includes a special keepsake. Booking essential. Call 01752 333500. See the Lord of Misrule who will be telling Christmas tales of life on the high seas and handing out a special gift to those who join in with the merrymaking. Booking essential. Call 01822 853607. Santa will be paying the children at Dawlish Christmas Market a very special visit at 12.30pm. Don’t miss him! Join Santa in this Panto style adventure around the caves. Includes an hour-long promenade performance, a visit with Santa, and a Christmas present for all children aged 2-12 years. Booking essential. For details call 01803 215136. Visit Father Christmas in his splendid festive grotto as part of the town’s Christmas market. For details ring 01803 863168. Be entertained by close-up magic and a two-part mini pantomime Snow White, before getting a visit from Father Christmas. All children will receive a gift. This is a fully ticketed event so pre-booking is essential. See what magical delights you will find on the Christmas Labyrinth Trail and have fun finding Santa as you explore the Model Village. You may need to go around twice to find him. There will be a small gift for children for do find him! Experience the festive magic at Bernaville Nurseries by visiting Santa’s grotto and receive a gift. Don’t forget to take your letter for Santa. this December. Booking essential – places are selling out already! Booking online is essential. For details call 01392 851326. Father Christmas will be visiting Knightshayes in the run up to the big day and will be handing out keepsakes in his workshop. 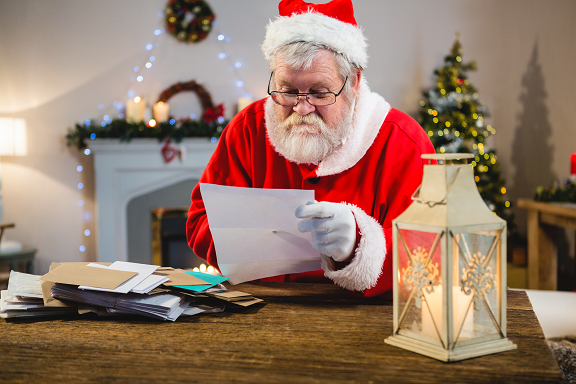 Learn about Christmas traditions and write a letter to send to the North Pole. For more details call 0344 249 1895. 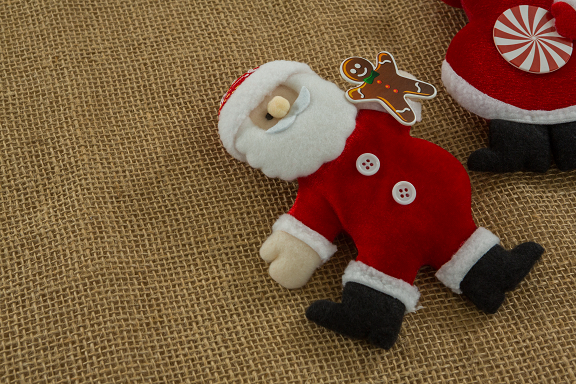 Father Christmas and his helpers will be meeting children and sharing out keepsake gifts. Santa’s helpers will be there to tell some festive stories and help children to write their letters which can be popped in the Greenway post. Call 01803 842382. 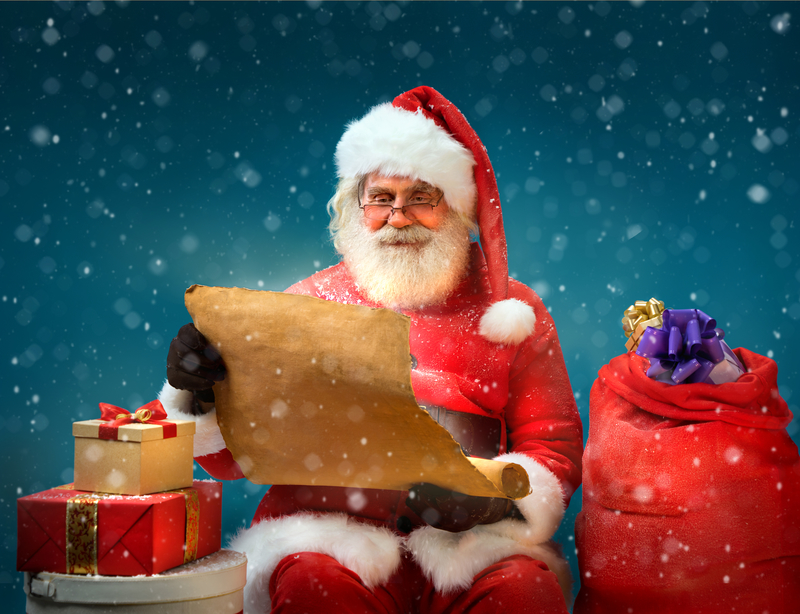 Meet Santa in his magical grotto and receive a fantastic present. Hop aboard the Christmas train and follow the gingerbread trail. Children who have booked to meet Santa will pick up a special gift from the elves as they leave. Pre-booking is essential. Call 01803 697500. Ride on the Pecorama Santa Special before meeting Santa in a winter wonderland and receive a special Christmas treat. Afterwards children can use the indoor soft play area. Pre-booking strongly advised. Call 01297 21542. Father Christmas will be making a very special visit to Castle Drogo. Follow the trail through the garden to find him and receive a special present. Cost: £3.50 to see Father Christmas plus normal admission applies. Call 01647 433306. Visit the festive grotto in the stables at the carriage museum and meet the traditional green Father Christmas. All good girls and boys will receive a present. Booking essential. Call 0344 249 1895. 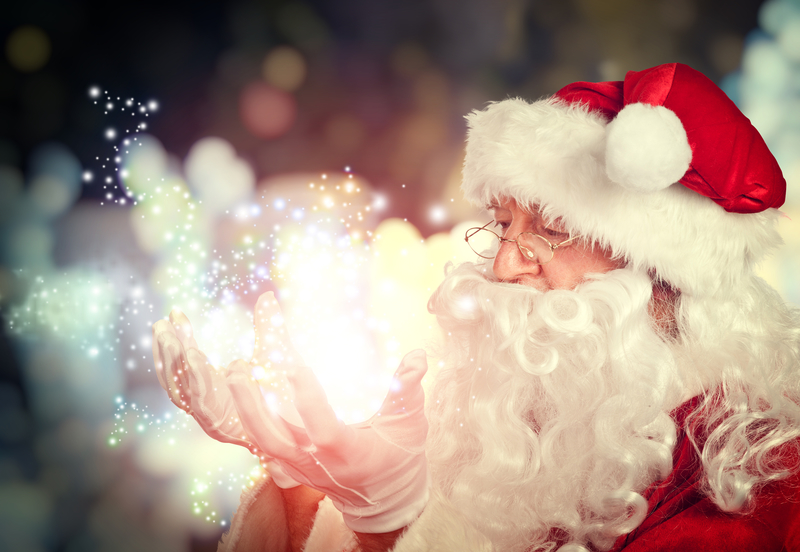 Children will have a truly magical Christmas experience at The Big Sheep and can have a very tasty breakfast with the great man in red at this special event. Plus, see Santa’s Magical Light Show and play in the Ewetopia Indoor Playground. A special evening train, leaving Buckfastleigh at 5.45pm, will be running for those who would like to experience the magic of travelling by steam train in the dark! Advanced booking is essential. Ring 01364 644370. Have a tasty supper with Santa at this fun indoor play centre. Includes a festive buffet, a Santa’s Grotto and fun activities. Cost: £10 per child. Booking essential. For details ring 01363 774626.